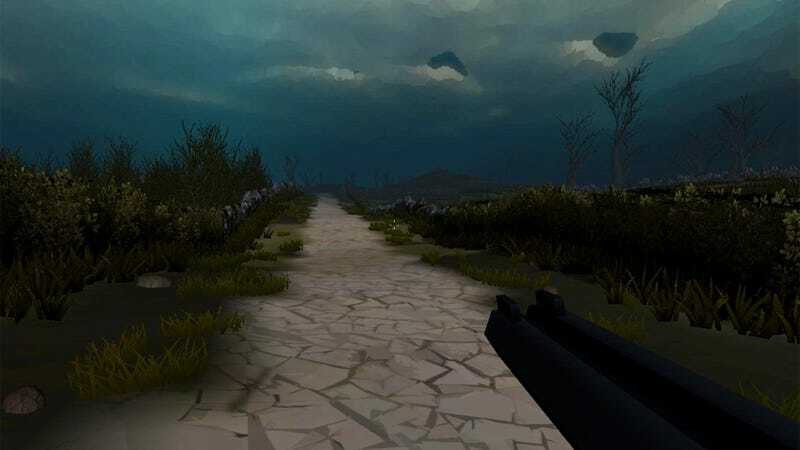 The idea behind Sir, You Are Being Hunted is, well, exactly what it sounds like. Man's greatest enemy is man. That's something we see in quite a few games, really. Mostly they have guns in them. Its inhabitants are a mockery of the aristocratic country gent and his ecosystem. Robots that ape tea-drinking, poachers that lurk in reed-beds, and red-eyed hounds that patrol the moor: these are the things you will be dealing with as you fight for survival. That "recognizably British" countryside, though, isn't made of a thousand carefully hand-placed stones, thoughtfully planted hedgerows, or individually tweaked blades of grass. It's all procedurally generated. "The screenshots haven't even been particularly agonised over. We just ran and fired off the screenshot key," Jim Rossignol explains in the blog post. Do the images look particularly British? Well to be honest, I can't necessarily say. I've been to London but that's as far into the UK as I've set foot. But they do look mysterious and haunting, in that "moonlit moors" sort of way. I feel like I can almost hear the howl of the Hound of the Baskervilles echoing past the leafless trees, no doubt exactly what they were aiming for. The gallery here has some highlights; scope out the original post for even more.